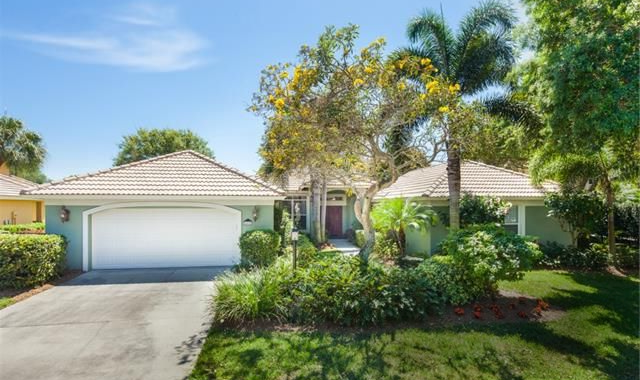 Monterey is a family community in the North Naples, Florida area, two miles east of Pelican Bay and 1.2 miles east of US 41 (Tamiami Trail) and 1.5 miles north of Pine Ridge Road. Entry to the gated and guarded community is on the north side of Orange Blossom Drive. Monterey is two-thirds of a mile west of Airport-Pulling Road and two-and-two-thirds miles west of Interstate 75. From the north, take I-75 Exit 111 West. Follow Immokalee Road just over a half mile to Livingston Road (second set of traffic lights). Turn left onto to Livingston Road and continue 2.7 miles south to Orange Blossom Drive. Turn right. Monterey will be on the right in 1.6 miles. You will know you are getting close when the center berm of the road is lush with palms and ornamental trees. Monterey Homes For Sale get updated every 15 minutes! The 420 luxurious Monterey homes include single-family, villas or condos located in four quiet neighborhoods. All homeowners are members of the Master Owners Association. The Master Association is the umbrella organization for the Single-Family Neighborhood Association, the Single-Family Villa Neighborhood Association, the Villa Owners Association, and the Villas Condominium Association. Many of the 292 single-family homes, 68 single-family villas, 20 attached villas, and 40 condos offer serene, lake views. The architecture and even the street names reflect the Monterey theme. Streets like Mission Drive, San Gabriel Lane, and Cordoba Circle are gentle reminders that you are not only living in Southwest Florida but that you reside in Monterey. The Monterey clubhouse is available for social events. It includes a fitness center and a 60-foot pool with lap lanes and a generous shallow area for children and family swim time, a spacious deck area next to one of the community’s sparkling lakes. Three lighted, Har-Tru tennis courts and a Bocce court are available for the pleasure of Monterey residents. School-age children attend either Pelican Marsh Elementary, Pine Ridge Middle, or Barron Collier High School, the home of the Cougars, honored by U.S. News & World Report as one of the Best High Schools in America in 2015. The high school, as mentioned above is just a few minutes away from Monterey. Pine Ridge Middle School is just about equidistant, but near the intersection of Pine Ridge and Goodlette-Frank Road. Pelican Marsh Elementary School is less than two miles north on Airport-Pulling Road. Every newcomer to the Naples area wants to know, “Which way to the beach?” For Monterey residents, it’s easy. Turn right on Orange Blossom Drive and follow it for three-quarters-of-a-mile until it ends at Goodlette-Frank Road. Turn right and drive nine-tenths of a mile to Vanderbilt Beach Road. Following a left turn, it’s a leisurely, two-and-a-quarter-mile drive to Vanderbilt Beach, one of the most beautiful beaches in all of Florida. Most day-to-day shopping needs are with a mile-and-a-half, with several shopping plazas at the corner of Pine Ridge and Airport-Pulling roads. For an upscale experience, the new Mercato shopping, dining, and entertainment district is two miles west at Vanderbilt Road and US 41. The fabulous Waterside Shops are just over two-and-a-half miles south via Goodlette-Frank and Pine Ridge Road. Monterey is a pleasant place to raise a family and to enjoy all that the Naples area and Southwest Florida have to offer.